Let’s face it. Your blog is stagnating. You keep checking your traffic for signs of growth but … none! The chart is as flat as a pancake. You desperately need to do something different, but what? Be honest — you’re baffled by all the options. And the endless stream of advice from the traffic experts only makes things worse. Don’t worry though. You’re not alone. 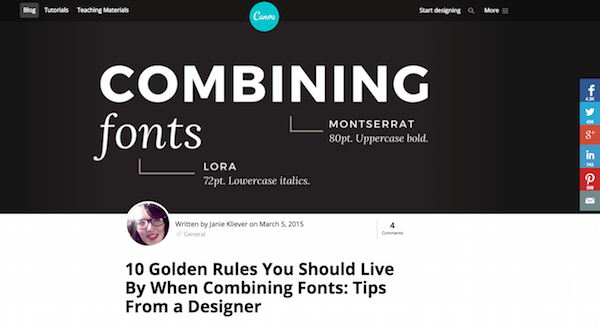 At Canva, we were facing this challenge with our design blog, Design School. 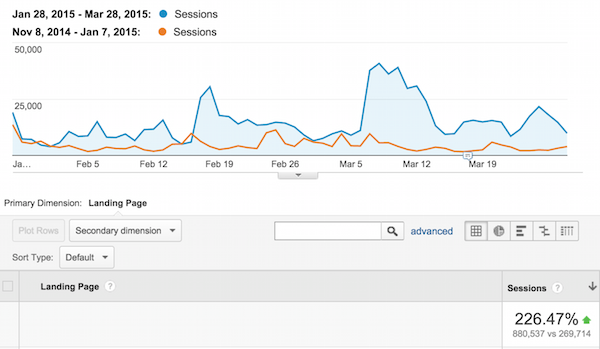 So we completely reengineered our blog strategy — and the results blew us away. Find out exactly what we did. And how you can do it too: How to increase your traffic within 60 days! If your traffic has stagnated, a common response is to generate more content. Because more content equals more traffic from Google, right? 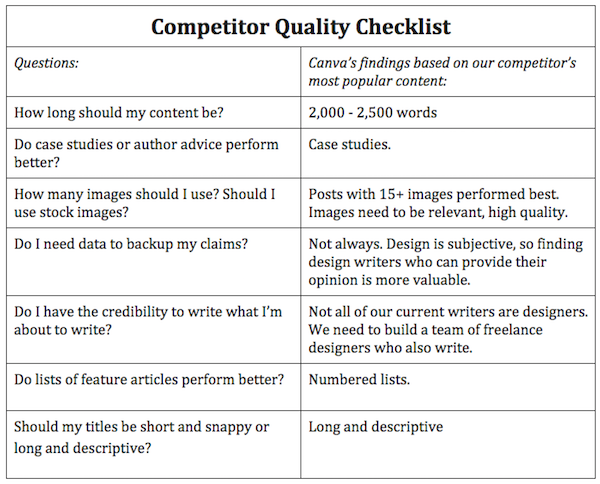 But quantity of content often comes at the expense of quality, so we took some time to consider our content strategy. How to increase your traffic: First, we revisited our original vision for Design Blog — to teach and inspire people to learn design. And while we still loved that idea, a vision isn’t the same as a goal. We needed something more concrete and actionable that we could implement. So we decided to focus on improving the quality of our content. And our goal became to create the best possible content to teach and inspire people around design. But to do that, we needed to find out what the best content on our topic actually looked like. So we reverse engineered the most popular content of our competitors to find out what content performs best. It reveals the topics that are most popular among your target audience. It reveals what type of content works well. For instance, are list posts the most effective? Do successful posts use lots of images? Here’s how we reverse engineered our competitors — and how you can do the same. If you’re not sure who your competitors are, perform a simple Google search using keywords or phrases common to your topic. Bloggers that rank in Google for those terms are likely to compete for the same audience as you. The first tool — Buzzsumo — is indispensable, which is probably why it’s so popular among content strategists. In a nutshell, Buzzsumo shows you which pieces of content performed well on social media for any given topic or website. Competitor analysis is invaluable because there’s no one-size-fits-all formula for quality content. Different types of content perform best for different audiences. So, from Smart Bloggers’s top-three results, what can we conclude? First, big lists do well. And if you study Buzzsumo’s results for the rest of Smart Blogger, you’ll see this pattern plays out nicely. Also, if you look at Copyblogger and other popular blogs in this space, you’ll find a similar trend. Second, people like comprehensive resources. And they would rather be given the answers (e.g., the exact words to cut from their writing) than be given broad principles that require more work to interpret. This is also true in our space where there’s more demand for free templates, icons and color-combinations than for information on how to create them. Here’s the takeaway. Buzzsumo can quickly give you direction for your content. Not just the popular topics, but the most effective type of content too. The second awesome place to do research is Quora. If you’ve noticed from your Buzzsumo research that particular topics perform well, Quora will give you a unique sell for those topics by finding new angles to take. After all, you don’t want to just copy your competitors. Their top-performing content can point you in the right direction, but tools like Quora can help you add value by covering topics that haven’t yet been fully explored. 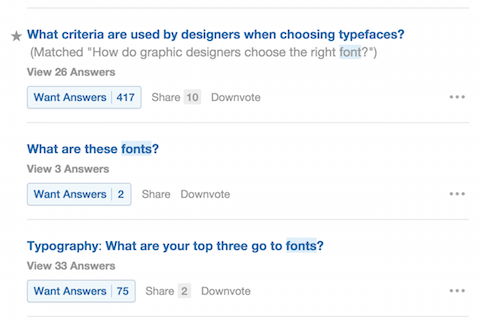 After examining these results, we decided to write an article about choosing fonts. But we didn’t stop there. You’ll notice that the first result has a grey star next to it, which is Quora’s way of determining which questions have high-quality answers. We noticed that lots of the answers in the thread were from design authorities. And such answers had an impressive amount of upvotes. So we added this touch, too, by framing the fact that a designer had written the post in the title. (The majority of our writers are designers, too.) This article was the result, and it received over 5k shares. In addition to using Buzzsumo and Quora to benchmark the popular content in our space, we studied every post several of our major competitors ever published. It was a lot of work, so why did we do it? Because most content research tools have a flaw — they are biased toward the new. Due to the sheer amount of content published on the web, many of these tools will only surface the most recent ones. Buzzsumo, for example, only goes back to the past year. That’s a problem because some topics will always be popular. We call this evergreen content. Grammar tips, for example, are useful today and will still be useful 50 years from now. If you don’t look at historical content, you could miss these important topics. A positive side effect of this exercise is that you also get a clear vision of what your community looks like. The more familiar you become with your community, the better your content will be as a result. Other than your competitors, you have another useful source of content intelligence: your readers. Because while content research can reveal topics that are already popular, it won’t reveal the topics that readers are only just beginning to get excited about. Here are a couple ways to find out what your readers want to read about right now. It seems obvious, right? Yet not nearly enough blogs do it. If you go to Design School and subscribe to our newsletter, you’ll get a personal thank-you note. In that note, we also ask people about their biggest challenge — even if it has nothing to do with design. And many people tell us! This achieves two useful goals. How to increase your traffic: First, it shows us the conversations already in their minds. And even though our subscribers often think a particular issue has nothing to do with design — like increasing traffic, for example — in truth, design can help them solve a lot of these issues. How to increase your traffic: Second, it shows them that we care. It’s easy to get caught up in your own strategy and let blog traffic feed your ego. But in the blogging world, your fans’ success is your success. Content that is genuinely helpful is genuinely engaging — and this principle should drive your editorial process. Never assume your readers are only interested in your content. Don’t consider them consuming content elsewhere an insult; instead, learn from what else they like to read. You can do this manually by clicking through the Twitter, Pinterest and Facebook pages of people who’ve shared your posts on these platforms. Or, use Buzzsumo and select the option to “view sharers” on any of your articles. From there, you can investigate further by looking at other links they’ve shared. You’d be surprised how many of your readers also frequent this other blog you’ve never heard of. In fact, this was how we discovered a lot of our competitors to begin with! Now that you know what your competitors write about, and what your readers want, you should have a long list of topics you know there’s a demand for. You should also have an idea of the quality you should be striving to meet. That’s the benchmark set by your competitors. But while the research process may already have given you some ideas for what types of content are popular, don’t make any guesses or assumptions without analyzing the data in full. Below is the checklist we used to determine our new quality standard, along with our findings. The questions evolved naturally from seeing where our existing content differed from our competitors’. How to increase your traffic: These research-backed findings replaced our gut-driven approach we had used to determine what our articles should look like. The lesson: make decisions based on hard data — not guesswork. You’d be surprised how many people go through steps 1 and 2 but are reluctant to implement their findings. But we found that following the data led to significantly improved results. The previous three steps will give you the data you need to create the content that realizes your vision for your blog. You won’t be surprised to hear that headlines are crucial. But you may be surprised to learn that you’ll never find the perfect one. Not on the first attempt anyway. How to increase your traffic. Take this post of ours as an example: Why Everyone From Beethoven, Goethe, Dickens, Darwin To Steve Jobs Took Long Walks and Why You Should Too. The original headline, as reflected in the banner, was simply, “Why Steve Jobs Took Long Walks and Why You Should Too”. But for some reason, that didn’t perform very well. Perhaps it’s because some people don’t like Steve Jobs. We can only guess. And actually, it doesn’t really matter. How to increase your traffic: We simply decided to change it and repost it — and it’s since received more than 70,000 shares across various social media networks. The point is that by adjusting the title and re-posting it on social media, we made what would be just-another-post into a viral one. You can do this kind of headline evolution manually or invest in a plugin like Kingsumo, that will do it automatically for you. Having the right headline only gets you so far. We knew we’d never realize our vision unless the content truly helped people learn about design. So another change we made — led by our research — was to use lots of examples and case studies in our articles. And even though this was revealed by a study of our topic — design — a lot of evidence suggests it works great for many other topics too. So we decided to keep our instructional how-to tone, but instead applied it to posts that show specifically how a professional designer would implement a particular design principle. Connecting your content to the real world is far more important than most people realize. For instance, one of the most important things you need to succeed as a blogger is credibility. And a great way to demonstrate credibility is to publish a case study. Like this one you’re reading right now. I am not a “certified content strategist” — but I’ve created and applied a successful content strategy for Canva, so that gives me credibility, right? How to increase your traffic: The other trick for grounding your content in the real world? Make your posts concrete. That means include step-by-step instructions — tell people exactly what to do. Instead of saying, “Promote your blog,” do what Brian Dean did with this post. He made liberal use of screenshots and examples — complete with templates you can use right away. Compare that to a generic post about blog promotion and you’ll realize this: concrete advice proves you know what you’re doing. I’m sure you’ve heard it before. Visual content gets shared more. (Jeff Bullas wrote about how articles with images get 94% more views than those without.) Like most bloggers, we thought we understood this, so we always included a featured image with our blog posts to make it more social-friendly. But looking back, we didn’t really understand the power of images. We thought we did, but we didn’t. Not until we conducted our research. Look what happens when you search for Design School on Pinterest. It’s flooded — not with featured images, but with graphics from our picture list posts. However, this doesn’t mean you should randomly pepper your posts with stock photography. The images need to make sense in context — and add value to your post. Like the screenshots and charts in this post. Or take this post on Design School as an example. It’s one of our most popular posts on Pinterest, getting over 700 pins. And it wasn’t a particularly lengthy post — but it does contain a lot of relevant images. If you don’t know what type of images to create for your blog posts, Pamela Wilson has a great article about that here. How did we manage it? It was a result of the strategic changes we made to our blog. Not our Facebook page or any other social platform. Our content was higher quality and resonated more strongly with our audience, so they naturally shared it more on social media. Pretty awesome, right? Blog stagnation is a terrifying prospect. Because stagnation is usually followed by decline — and then demise. Yet it doesn’t have to be that way. A bold new strategy can jolt your blog out of its rut. But how will you find that strategy? On what will it be based? The latest recommendations from the expert du jour? An unidentifiable gut feeling about the right direction to take? Or something else altogether? In truth, building a popular blog is not about holding out for the perfect strategy. It’s about relentless testing and knowing that you don’t need to do everything right to succeed. It’s about research, experimentation, and gaining a deep understanding of your readers and your competitors. At Canva, we shifted our strategy and it made a huge difference to our traffic — in just 60 days. We couldn’t have done it if we skipped any the steps above. We’ve had our breakthrough; now it’s time for you to have yours. Because visions are far more exciting when you can see them made real. I hope, you like this article about how to increase your traffic. To stay up to date. Just like my Facebook Fanpage: The Doan’s Blog. If you want to know, how to get sustainable traffic, read this: What is SEO? My most popular blog article: International money and Secrets of the Super Rich. Weiter Nächster Beitrag: What is a landing page?